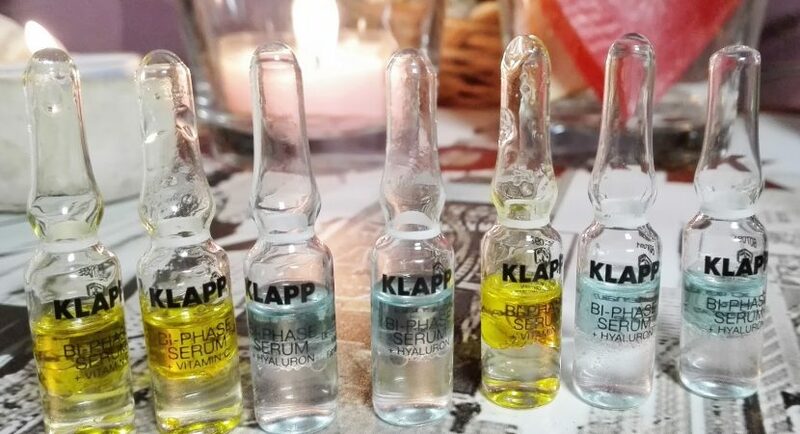 Bi-Phase Serum ampoules by KLAPP Cosmetics – Novelity of 2016. The latest researches on skin lipid layer have fructified with launching a new product by Klapp Cosmetics. Dual-phase ampoules Bi-Phase Serum are components of Power Effect series that offers innovative skin care action. The ampoules eliminate skin problems that tend to develop with age (+30). The product can be used by people having sensitive skin. How does Bi-Phase Serum work? First of all, action provided by Bi-Phase Serum from Power Effect series depends on concentrated formula of active substances. To demonstrate, one ampoule combines two elements – water and oil phase. Water phase works in harmony with natural lipids present in skin structure. Thanks to high-tech technology, the water phase is fast to penetrate deep into skin. Oil phase in turn is responsible for creating a kind of protective coat on skin, which facilitates working of the water phase. What is the secret of Bi-Phase by Klapp? Depending on version (there are four types of Bi-Phase Power Effect), the base ingredient of water phase is retinol (A vitamin), ascorbic acid (C vitamin), hyaluronic acid or Regestril™ complex. The main ingredients of oil phase are almond and jojoba oil, which are to fix the hydrolipid coat of epidermis. What does Power Effect Bi-Phase offer? As mentioned before, the ampoules are available in four versions, which are responsible for stimulating, strengthening and smoothing (Power Effect Bi-Phase Serum + Retinol), moisturizing and filling (Power Effect Bi-Phase Serum + Hyaluron), activating, revitalizing and highlighting (Power Effect Bi-Phase Serum + Vitamin C), anti-ageing and strengthening (Power Effect Bi-Phase Serum + Regestril™). Described by the producer effects are expected to be produced just after a two-week treatment. A single ampoule contains a dosage enough to conduct one session. The ampoules should be applied every other day. Bi-Phase Serum products are designed especially for super dehydrated skin that requires intensive treatment.